Located in a perfect spot opposite Havana's famous Parque Central and steps from the iconic Bar Floridita bar (think Hemmingway) as well as a myriad of monuments, at Iberostar Parque Central you can literally roll out of bed straight into history. The Iberostar city hotels have an uncanny knack of turning up in the best possible city locations and the Iberostar Parque Central delivers. Located in a perfect spot opposite Havana‘s famous Parque Central and steps from the iconic Bar Floridita (think Hemingway) as well as a myriad of monuments, you can literally roll out of bed straight into history. Dressed in Spanish colonial style decor painted in warm bright colours, there’s plenty of lush greenery, floral arrangements to add colour. The space comprises the reception and lobby which has a sweeping staircase that leads to the mezzanine floor where the walls are covered in gorgeous artworks. 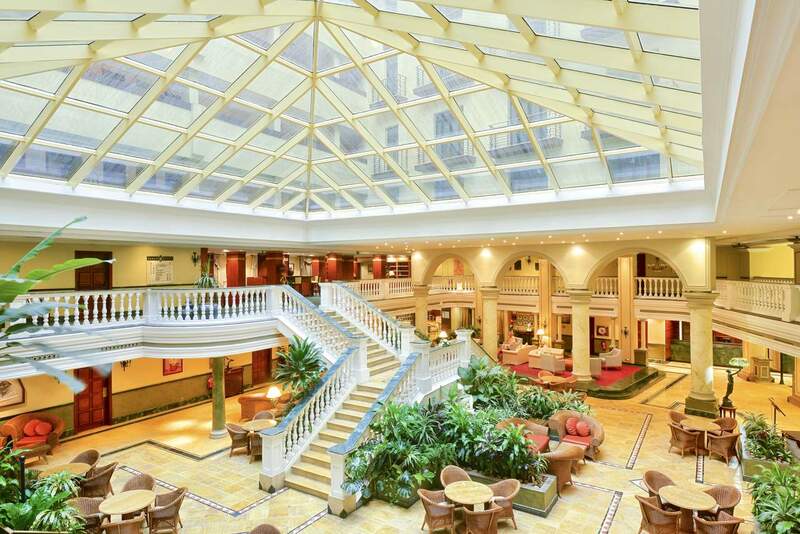 It is all lit up with lashings of daylight that make its way in through the glass dome of the atrium. It’s a lovely first impression and though check-in may be busy, being handed a glass of cold lemonade eases the way. Despite the bustle of people checking in and out, guests sipping a tipple by the long bar, business men whispering deals in discrete corners or tourists lounging around on the sofas with coffee and cake, there’s an air of pleasant decorum that’s made all the more calm by the all-day live bands who mete out easy-listening Cuban music from their corner of the lobby. Incidentally: Adjacent to the original hotel is a the newer section which though can be accessed from the original building and has its own entry and reception. Rooms are spacious, it comes with its own swimming pool and own breakfast room. It’s not as plush but still a pleasant, clean hotel and ideal for those with a budget. This review is for the main hotel. City breakers, business travellers and families. 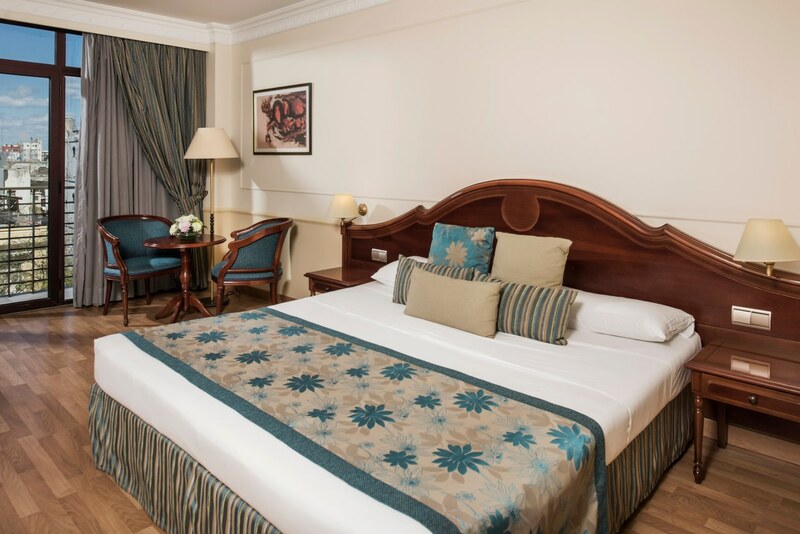 There are 427 air-conditioned rooms with standard doubles (king beds), and various decorated in muted tones of greens and beiges. Some have balconies but all have a flat-screen TV, mini bars, bathroom and slippers. Tip: Ask for a room with views of the Parque Central and watch the vintage cars roll in and out of the taxi rank and enjoy the park and the monumental buildings around it. The roof top pool has sensational views over the city and comes with several jacuzzi’s positioned at the edges especially so you enjoy the panorama. Naturally there’s a specialised Cuban cigar sommelier in the lobby and a very useful bureau de change; tourists have their own currency in Cuba and you can get these CUC’s here. If you have to work, there is a full service business centre available. But later you can relax in the spa and gym or just sunbathe on one of the sunbeds around the pool. The buffet breakfast is a huge spread with various cakes, croissants, and of course cooked breakfast. But the star of the show is the room itself with its gorgeous mural, impressive pillars and elegant decor. Oh and of course the Bucks Fizz you are handed as you walk in. 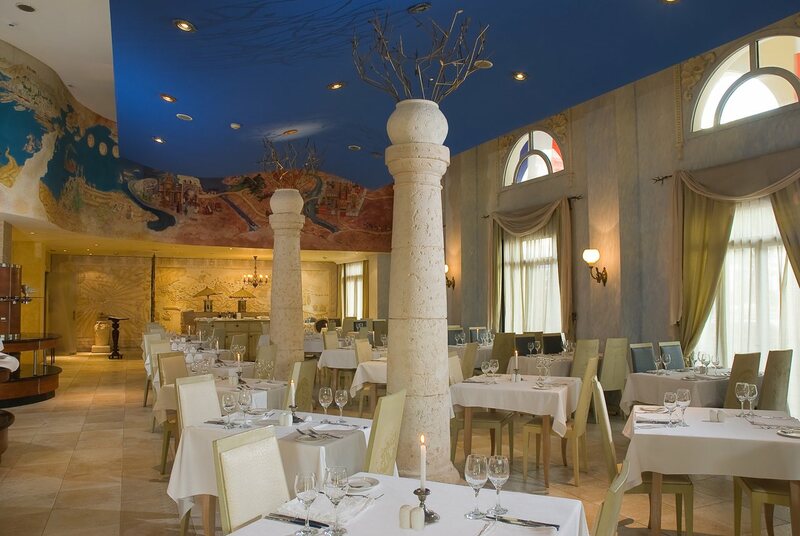 There’s also three speciality restaurants that offer lunch and dinner: Mirabana serving authentic Cuban dishes with a modern twist, Mediterraneo buffet restaurant and El Paseo Steak House, a meat, fish and seafood grill. 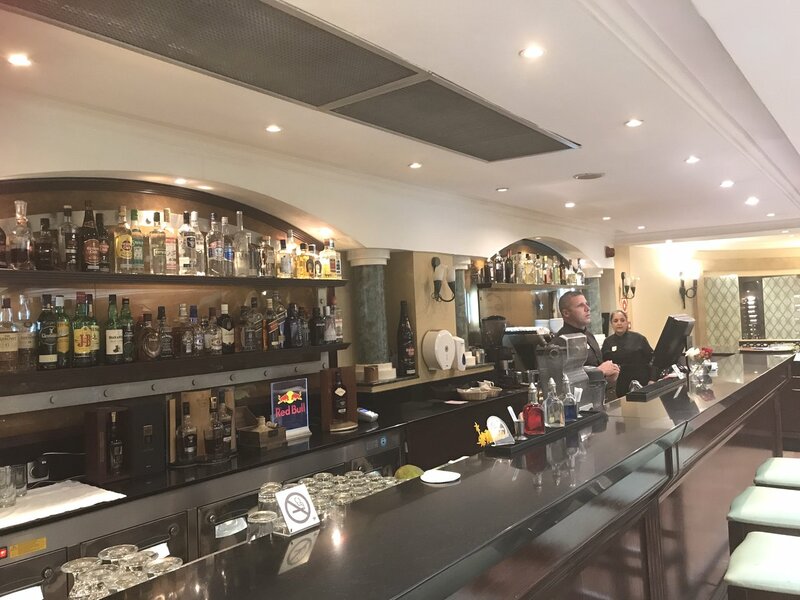 There are four bars: two bars in the reception (Bar Portico on the ground floor and another on the mezzanine) and two pool bars. 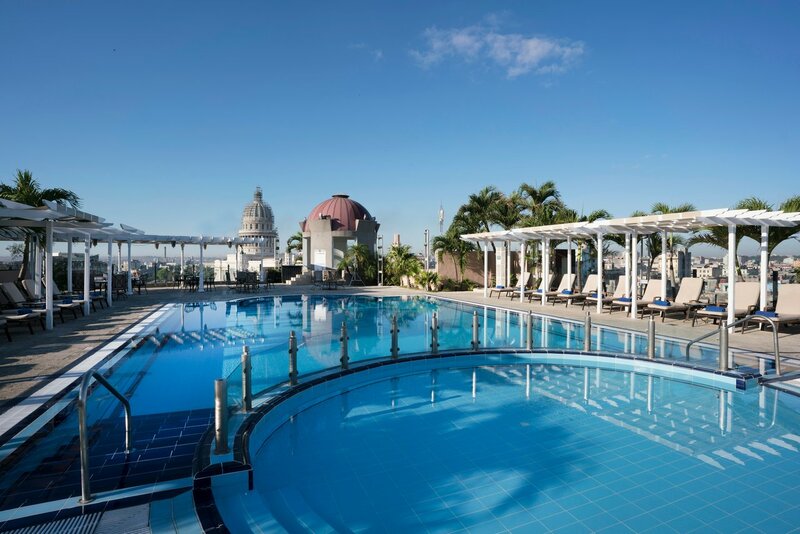 You can eat lunch or dine in the poolside restaurant and as you do you get the view of Centro Habana in one direction and see the ocean and the city centre at the other. 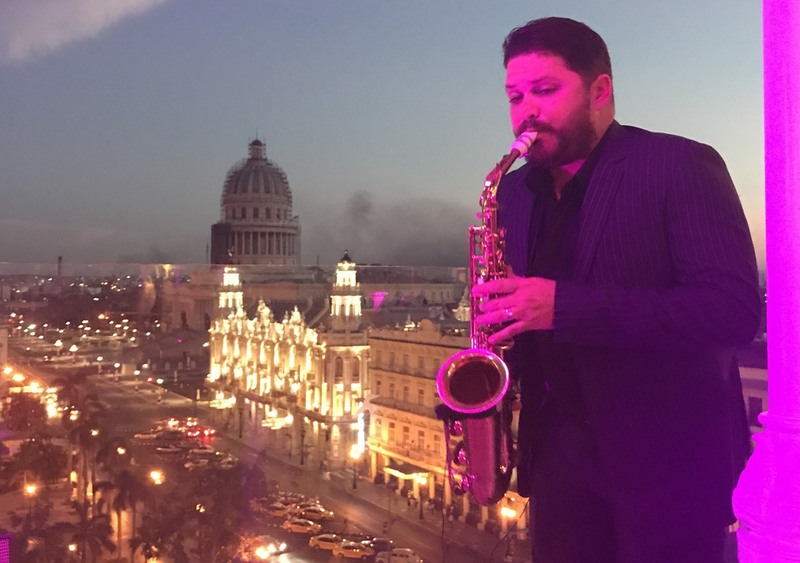 Tip: Spend at least one evening dining at the poolside restaurant which is awash in pink light by night while smooth jazz is played by a roving saxaphonist to a backdrop of Old Havana. Order a Hemmingway Daquairi to round off the moment. Cuba is probably around 15 years behind when it comes to Wi-Fi. However the hotel can offer scratch cards with logins for use in the lobby area. This hotel is slap bang in the middle of everything you would want to see in “Habana Vieja” – Old Town. The Museo Nacional de Bellas Artes de La Habana is almost opposite and Central Parque is steps away, while Prado Avenue is right on the doorstep and the must-walk down Obispo Street is round the corner. And of course the conic Bar Floridita famous for the Daiquiri cocktail which Ernest Hemingway would drink during his many hours here. If a Mojito is more your style stop by Bodegita del Medio for a tipple or two. Tip: Ask the concierge about a tour of the city. The cost for this is CUC35.00 per hour and you get to see Havana from convertible vintage car. There is a “taxi” rank just outside. Please note: Visa, MasterCard and Euro Card are accepted only if not issued or related to USA banks. 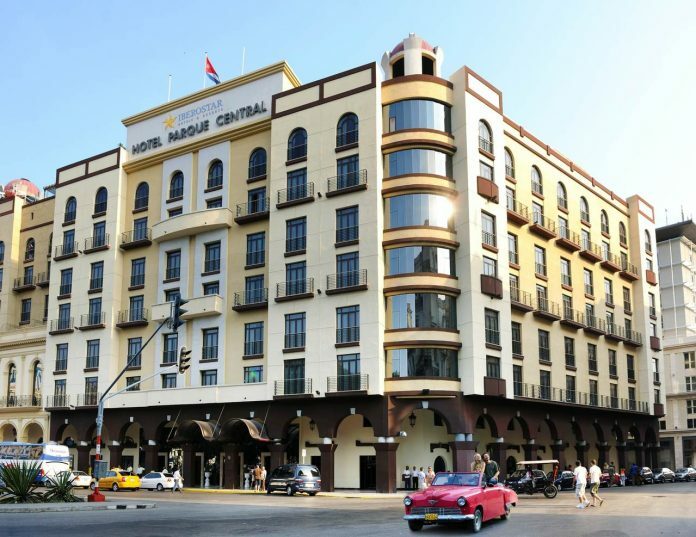 Iberostar Parque Central is a great choice in Havana. Ideal location for tourists, spacious rooms, plenty of food and drink options, a great vibe with music in the air and artwork for eye candy. Everything is in place for the perfect short break in this up-and-coming city.